We have visited hundreds of places in New York State and all are terrific in their own way. But once in a while, you see or do something here that surpasses all others, something that goes beyond an excursion and enters the realm of a life-long memory in the making. 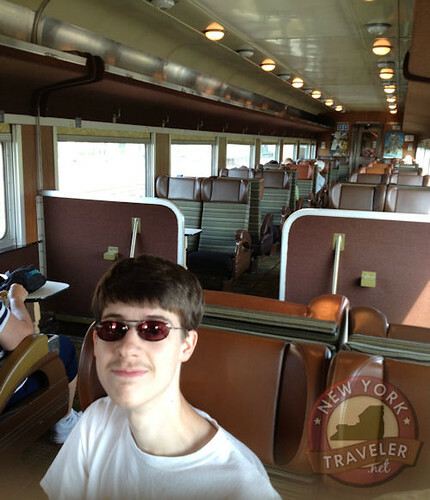 Such is the Adirondack Scenic Railroad, based in Utica, New York. If you do nothing else in the Mohawk Valley, go on this railroad. It’s the crowning jewel of Central New York. 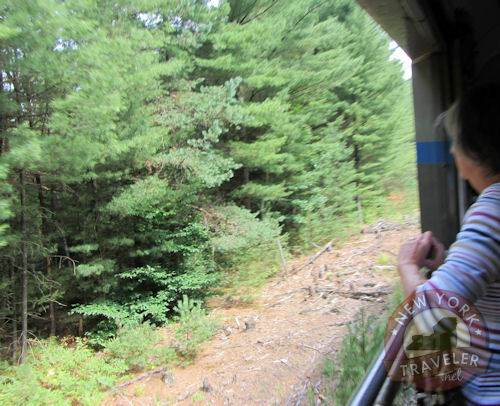 I rode the ADK RR as a child and I wanted my children to experience it, too. I still remember the monotonous clatter of the train on its tracks, the beautiful forests, and a mock train robbery by the infamous Loomis gang. I am so grateful the ADK RR still exists. There was a time when the railroad was shut down by New York State — shortly after my youthful excursion in the late 70s — and it seemed that the ADK RR would never rise again. Thanks to some amazing rail enthusiasts and volunteers, the line was resurrected. In 1993, the railroad was registered in the National Register of Historic Places along with the New York State Register of Historic Places and opened again with a short run from Remsen to Lake Placid. The public LOVED it. 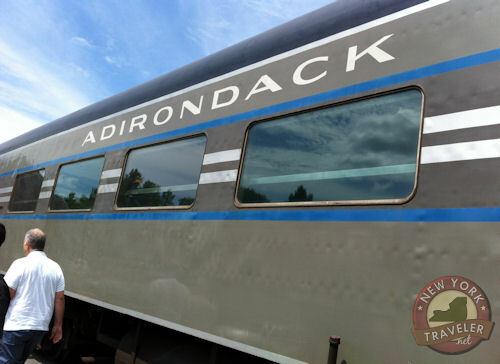 Donations came in, and on the summer of 1994, the official Adirondack Scenic Railroad, operated by the Adirondack Railway Preservation Society, Inc., was born. The company is a not-for-profit corporation and is run by a staff of 150 volunteers and some full and part-time employees. 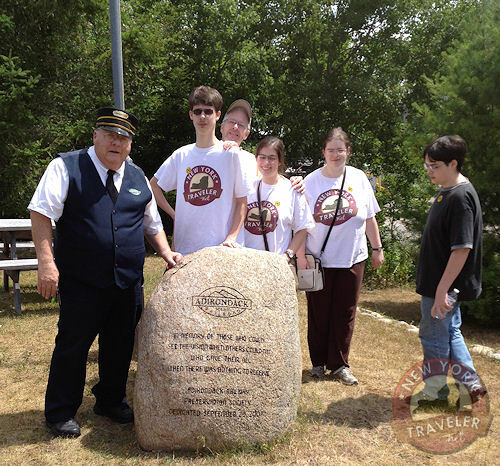 The dedication, adoration, and enthusiasm of the rail line really shows through and makes the event so special. The family LOVED this trip. 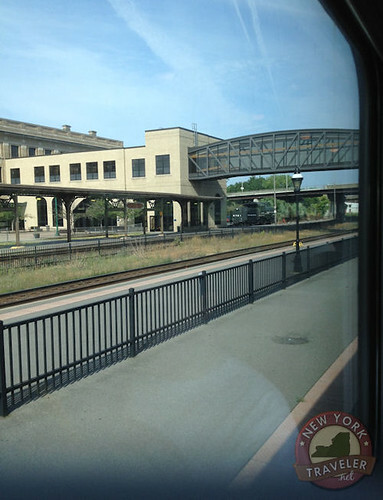 The train departs from Utica, NY, at Union Station. Get your tickets at the Adirondack Scenic Railroad booth in one of the storefronts in Union Station. I wasn’t sure where to board from there, but a Car Host named Jim was standing by waiting to direct passengers. 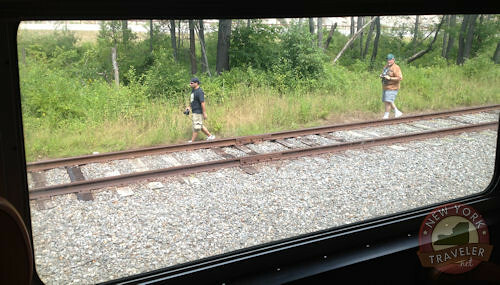 He was a hoot, escorting us up the walkway and to the train itself, all the while cracking one-liners. My husband loved it. I was struck by the exceptional friendliness of everyone there, from the guy who checks the tracks for safety to the conductor to the hosts. Every one was jolly and cheery and it made for a really, really fun time. 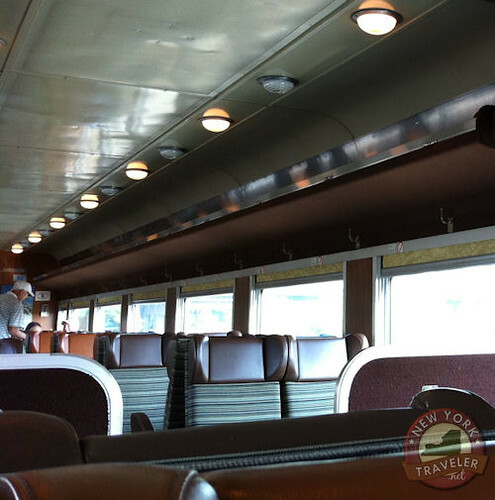 The train cars are a little older but in good shape. One of the hosts said the railroad had recently acquired some cars from Canada, and they have air conditioning! We were free to wander from car to car, taking our time and choosing the best seats. Some trains had small fold-down tables between the seats. The kids loved these. Once settled, we listened to the conductor over the speaker system. He introduced the ADK RR, gave a brief synopsis of our trip, and provided reams of witty banter that kept us all giggling. It was such fun — we have GOT to travel this again! Already I am thinking of when to return. 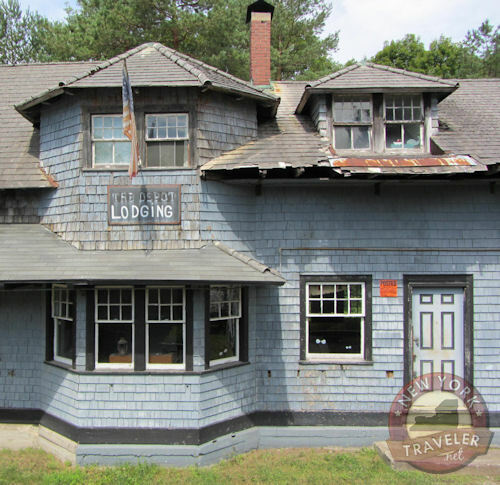 The train leaves Utica at 9:15am for Thendara, a small hamlet at the foothills of the Adirondack Park. 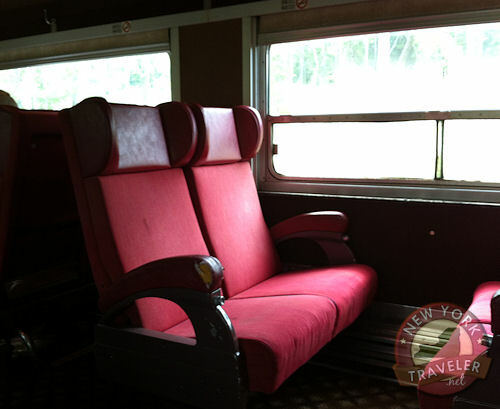 The train ride to Thendara takes about two hours one way. 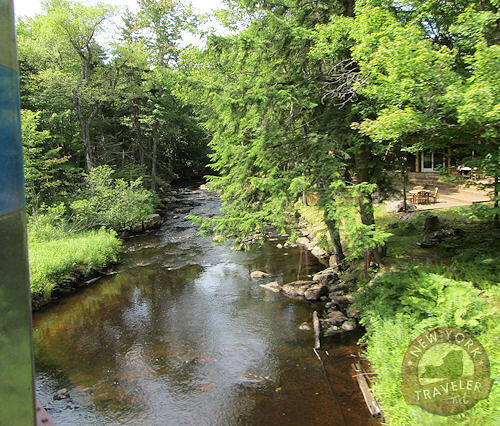 Once in Thendara, a shuttle bus drives us to Old Forge (for FREE!) for a five-hour layover. The time goes by very, very quickly, believe me. About 4pm, the shuttle bus picks us up at a particular spot and takes us back to the Thendara Station and back to Utica. At first, the views from the train are of a typical industrial city. I could spot the golden dome of the Utica Bank in the distance, and we saw the Hotel Utica as we passed by. The foliage is scrubby and flat. The train chugs northward, however, and after about an hour the vista opens up into some of the loveliest views in the area. 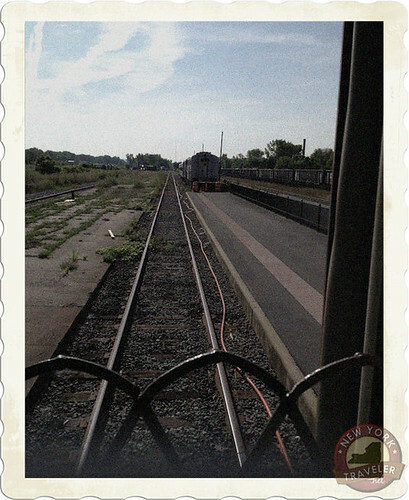 The conductor told us that we could walk up to the baggage car and enjoy an “open air” view of the ride. This is so cool! I spent most of the ride north in the baggage car. 🙂 It was noisy and windy, but the scenery is exquisite and it’s definitely an adventure. For those who stay in the seats, the conductor continues an informational and very humorous banter over the speaker system. 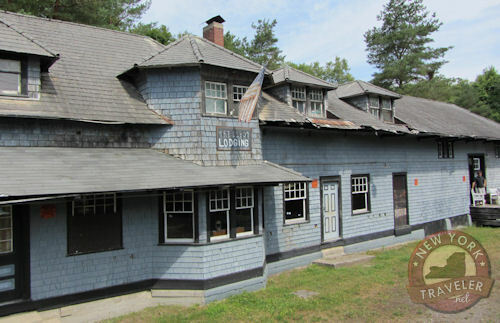 This is an old station in Forestport. I wonder if they are going to restore it? It was empty and in bad repair but I did see some activity. Every once in a while, we’d look outside the window and see “train chasers.” They followed us from Utica all the way to Thendara, waving and taking photographs! I wonder what they were doing? The train stops at the lovely Thendara Station. There’s a nice memorial to those who made all this possible. Our shuttle bus was ready and waiting. My kids have never ridden in a school bus, so this was another new experience for them. For me, it brought back lots of crazy memories! The shuttle trip takes about 15 minutes, weaving through small country roads to Old Forge, one of the largest towns in the lower Adirondacks. 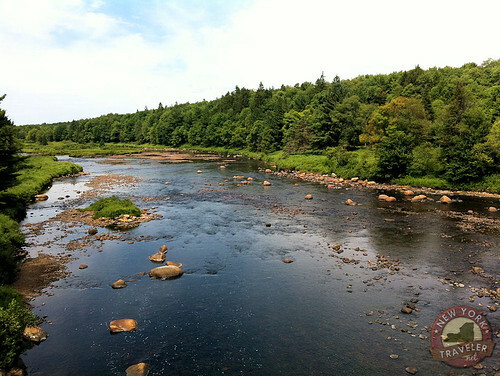 Old Forge is a flurry of activity — restaurants, hotels, shops, and more. You can ask the bus driver to take you to McCauley Mountain to ride the ski lift, to the Enchanted Forest Water Safari park (train passengers get 1/2-off admission of you show your train tickets at the counter), or to the Central Adirondack Steamboat Landing for a two-hour cruise. We chose the cruise — more on that later! The time literally FLIES. After the boat cruise, we had to find a place to gobble lunch and get back to the shuttle. The bus driver was excellent — she uncannily remembered every passenger and made sure we were all back on the bus before taking off the train station. No one was left behind. Excellent service! Getting back to the train after a long, hot day was WONDERFUL. We plopped into our seats and stretched out. I skipped the baggage car this time and opted to relax with a few of the kids in the cushy seats. We joked and laughed and had fun, just being together. NO VIDEO GAMES, no TV, no CELL PHONES — it was wonderful!!! 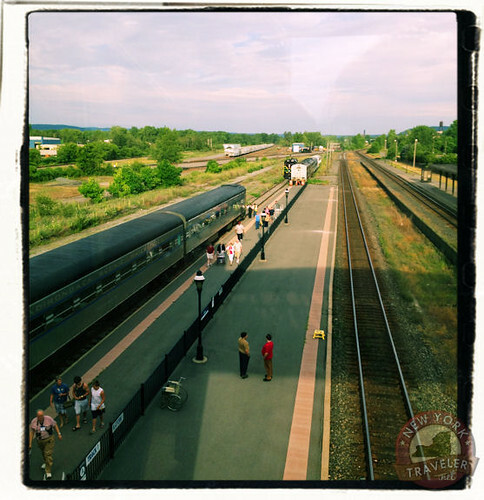 Besides the Utica-Thendara Trip, the Adirondack Railroad features a slew of other rail rides. There’s the Utica-Remsen Beer & Wine Tasting Trip, the Utica-Forestport Buffalo Head Dining Trip (Which I want to take sometime! ), the Utica-Remsen Doo Wop Train, the Utica-Thendara Christmas Train (gotta go on this, too! 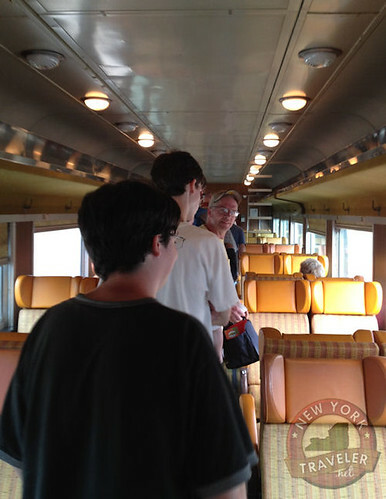 ), the VERY popular Polar Express Train from Utica to Holland Patent (very popular with the kids around here), and trains from Lake Placid to Saranac Lake (gotta do this one, too!). The ADK RR has many specials going on, including Senior Discount Days, Train Robbery Days!, a Clown Train, and loads more. 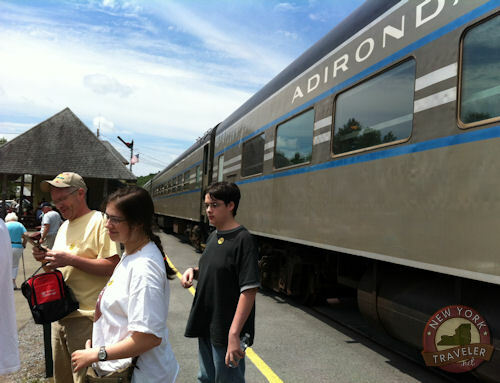 GO on the Adirondack Scenic Railroad. JUST DO IT. Note: The Adirondack Scenic Railroad company gave me tickets in exchange for this review with photographs and video footage. All my opinions are 100 percent honest and my story of our experiences are 100 percent genuine. I rode anonymously so the crew did not know who I was, and I never received special treatment more than any of the other passengers. I personally and highly recommend the Adirondack Scenic Railroad, and if you can I encourage you to support it with donations to keep it running! These folks are terrific!